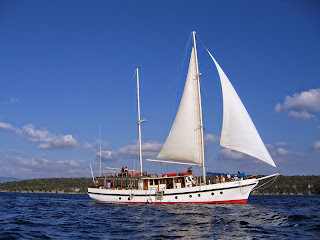 ONE of the more-popular outings on a visit to Vanuatu's Port Vila is a day on, and in, the briny with the historic 23m ketch Coongoola, revelling in sun, sand, coral reef snorkelling, fish feeding, a visit to a turtle hatchery and a cracker-jack barbecue on a beach in the historic harbour where the Americans readied themselves for 1942's Battle of the Coral Sea. 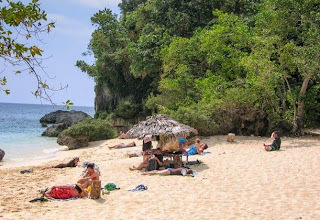 That day at Hapi Tok Beach (local pidgin from Happy Talk in the musical South Pacific,) long evokes grand memories for the thousands who've sailed, sunned and played there over the years. And not the least of those memories is the food: morning tea with French buns and homemade cumquat marmalade on the way out from Coongoola's mooring 40-minutes by private mini-bus from Vila, fresh tropical-fruit platters for afternoon tea on the way back, and a mountainous beach barbecue in-between with prime tender steaks, kumala (sweet potato) curry, local garden-produce side dishes, and crunchy French-style mini-baguettes. Trés bien! There's also an over-size ice-box with enough beer and soft-drinks to keep the most enthusiastically-thirsty well-slaked under a tropic sun, with an honesty box for payment. 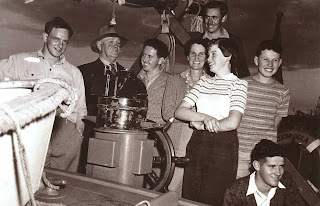 We've indulged many a happy outing ourselves on Coongoola over the years, and were saddened to learn just recently of the death last September of one of the ketch's original crew, a legendary character who helped put she and Australia on the world sailing map some 66 years ago. Coongoola had been built in 1948 for a Queensland businessman, G.H. (Bert) Griffiths who owned Toowoomba's Southern Cross Foundry, famous across rural Australia for its diesel engines and windmill-driven water-pumps; sensing potentially lucrative markets in Southern Africa, GH (as he was best known) had had Coongoola built to take examples of his products across there to test those markets. 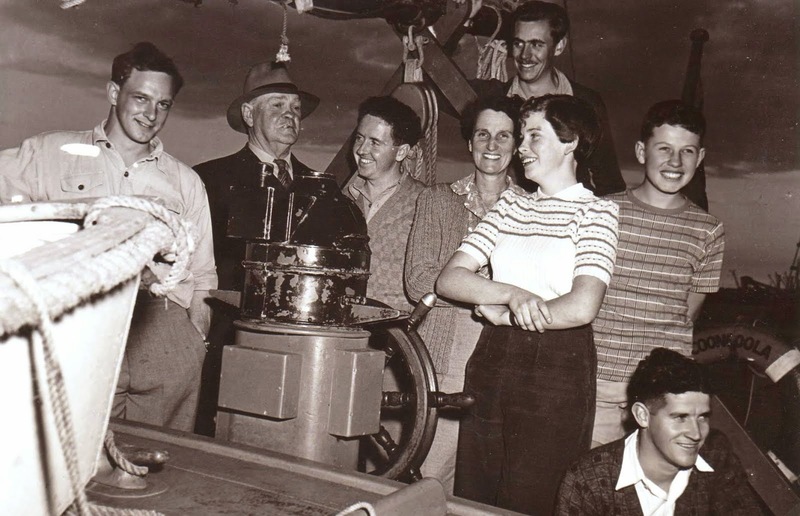 On September 24 1949 Coongoola set sail from Brisbane with GH, his wife, their two teenage children, a professional skipper, and amongst the crew a young engineer from his foundry. That engineer was Doug Owens, who stayed with GH's company for the remaining near-40 years of his working life, and passed away on September 24 last year – extraordinarily 64 years to the very day after setting out from Brisbane on that historic Coongoola maiden voyage. Doug's dad was a Tasmanian and his mum came from the one of Australia's great pioneering grazing families, the Barden's who in the late 1800s owned vast tracts of now-suburbia, but then cattle-country stretching from Tempe near what was to become Sydney's Mascot Airport, to the-now suburb of (appropriately) Barden Ridge 30km south. 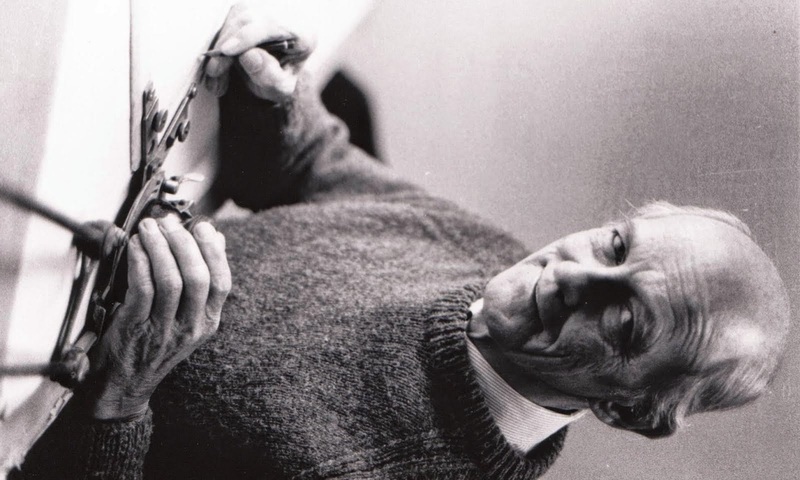 They later moved to Toowoomba where Doug was born in 1926, winning himself an engineering cadetship with GH Griffiths and going on to later spear-head new-design Southern Cross diesel motors and windmills. Their 30,000km trip to Africa was by way of Darwin, Timor, Bali, Jakarta, Singapore, Penang, Colombo, the Maldives, Seychelles, Mombasa, Zanzibar and Durban, and back via Mauritius, Fremantle, Adelaide, Melbourne and Sydney to Brisbane. Later Doug also sailed a round-world voyage with the Griffiths, keeping Coongoola ticking over as engineer and radio officer. And on that 15-months trip (1952-1954) he re-united in London with a past girlfriend, Shirley, marrying her in Australia in 1954 and the two sharing their lives for the next 59 years, including having three sons, Richard, Stephen and Geoffrey. Doug proved an indispensable right-hand man to GH, both on Coongoola which GH finally sold in the late 1950s, in his foundry, and later as General Manager of GH's other venture, ClayWare Bricks – overseeing production, he reckoned, of 130 million bricks before retiring in 1986. 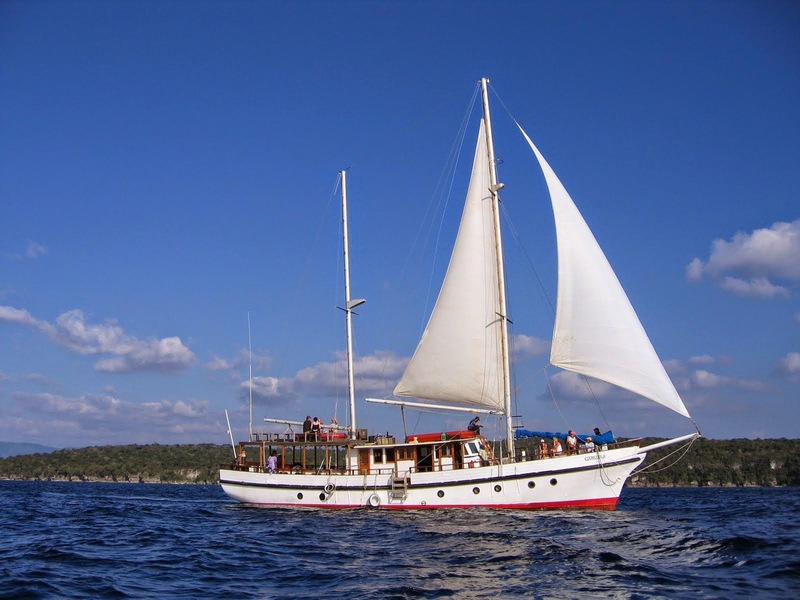 And to the end in September last year, he recalled fondest memories of his almost Boys' Own adventures aboard Coongoola… including on the way to Southern Africa nearly being rolled over in a cyclone off Mozambique, and on their way home tossed from wave-top to wave-top by another. Doug died in his sleep aged 87 – no doubt happy in his mind that his beloved Coongoola continues to sail on today in Vanuatu. He is survived by Shirley, their three sons and a granddaughter, Skie.